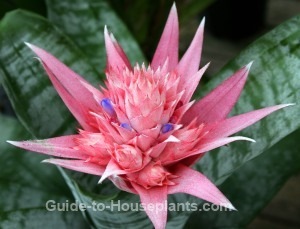 Despite its tropical nature, growing a bromeliad plant indoors is easy. The Bromeliaceae family is sometimes referred to as the pineapple family. However, this clan is a diverse group offering some of the most exotic, flowering house plants you'll find anywhere. Purple flowers pop up through pink bracts when the plant is at least 3 years old. The flowers are short-lived, but the bracts will last for months, making this a stunning tropical plant to add to your bromeliad collection. Get care tips for Urn Plant here. You'll discover how to water, when to fertilize, when and how to propagate, plus -- how to coax this plant to bloom. 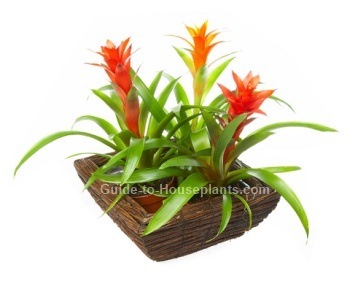 Guzmania lingulata is one of the most popular house plants in this family. And it's no wonder. This showy plant has a long-lasting quilled spike in brilliant red, giving it the common name of Scarlet Star. Other varieties are yellow, orange or mauve. This tropical bromeliad plant produces offsets -- called pups -- near the base of the plant. Pot up these pups when they are at least 5 months old. You'll have an ongoing collection of beautiful bromes. Did you know this about bromeliad plants? Bromeliaceae is one of the most diverse plant families with more than 2,000 species including Spanish moss and pineapple. 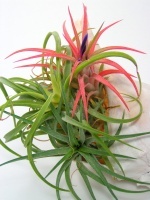 Air Plant is a species of Tillandsia. What sets this species apart is its ability to grow virtually anywhere because of its shallow roots. Grow it in a seashell, as shown here, or mount the plant on a wreath or a piece of driftwood. Or you can simply tuck an air plant into a small cup or vase. Buying Tip: When buying a bromeliad, choose one that hasn't bloomed yet, or is just starting to bloom. Bromes typically bloom for just a few weeks and it's a long wait before you'll see another show of flowers. Their colorful bracts, however, last for months. Pink Quill gets its name from the plume of bright pink bracts that last for months. It typically blooms in summer when violet-blue flowers emerge from between the bracts. This is truly a spectacular flowering house plant to add to your collection. 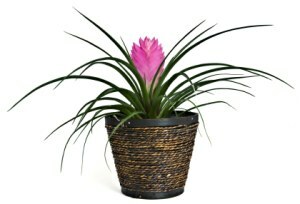 Pink Quill is the only brome from the Tillandsia genus that can grow in a pot. But its shallow roots give you other options for growing it indoors.